Shipping deep learning models to production is a non-trivial task. If you don’t believe me, take a second and look at the “tech giants” such as Amazon, Google, Microsoft, etc. — nearly all of them provide some method to ship your machine learning/deep learning models to production in the cloud. Going with a model deployment service is perfectly fine and acceptable…but what if you wanted to own the entire process and not rely on external services? How would you go about shipping your deep learning models to production in these situations, and perhaps most importantly, making it scalable at the same time? Part one (which was posted on the official Keras.io blog!) is a simple Keras + deep learning REST API which is intended for single threaded use with no concurrent requests. This method is a perfect fit if this is your first time building a deep learning web server or if you’re working on a home/hobby project. In part two we demonstrated how to leverage Redis along with message queueing/message brokering paradigms to efficiently batch process incoming inference requests (but with a small caveat on server threading that could cause problems). In the final part of this series, I’ll show you how to resolve these server threading issues, further scale our method, provide benchmarks, and demonstrate how to efficiently scale deep learning in production using Keras, Redis, Flask, and Apache. As the results of our stress test will demonstrate, our single GPU machine can easily handle 500 concurrent requests (0.05 second delay in between each one) without ever breaking a sweat — this performance continues to scale as well. To learn how to ship your own deep learning models to production using Keras, Redis, Flask, and Apache, just keep reading. The code for this blog post is primarily based on our previous post, but with some minor modifications — the first part of today’s guide will review these changes along with our project structure. From there we’ll move on to configuring our deep learning web application, including installing and configuring any packages you may need (Redis, Apache, etc.). Finally, we’ll stress test our server and benchmark our results. For a quick overview of our deep learning production system (including a demo) be sure to watch the video above! contains all our Flask web server code — Apache will load this when starting our deep learning web app. contains all Python-based settings for our deep learning productions service, such as Redis host/port information, image classification settings, image queue name, etc. contains our WSGI settings so we can serve the Flask app from our Apache server. can be used to programmatically consume the results of our deep learning API service. is a photo of my family’s beagle. We’ll be using her as an example image when calling the REST API to validate it is indeed working. to stress our server and measure image classification throughout. monitors Redis for results to send back to the client). But what good is a deep learning REST API server unless we know its capabilities and limitations? , we test our server. We’ll accomplish this by kicking off 500 concurrent threads which will send our images to the server for classification in parallel. I recommend running this on the server localhost to start, and then running it from a client that is off site. Figure 1: Data flow diagram for a deep learning REST API server built with Python, Keras, Redis, and Flask. Nearly every single line of code used in this project comes from our previous post on building a scalable deep learning REST API — the only change is that we are moving some of the code to separate files to facilitate scalability in a production environment. As a matter of completeness I’ll be including the source code to each file in this blog post (and in the “Downloads” section of this blog post). For a detailed review of the files, please see the previous post. you’ll be able to change parameters for the server connectivity, image dimensions + data type, and server queuing. encoding and the other for decoding. Encoding is necessary so that we can serialize + store our image in Redis. Likewise, decoding is necessary so that we can deserialize the image into NumPy array format prior to pre-processing. 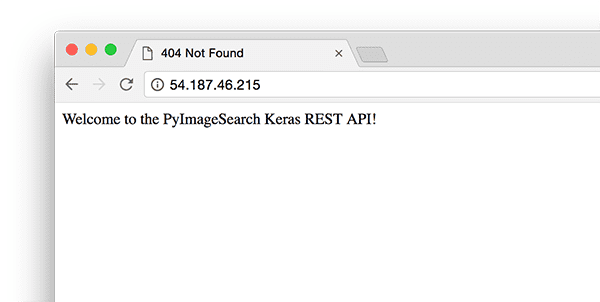 return "Welcome to the PyImageSearch Keras REST API!" function pushes the encoded image into the Redis queue and then continually loops/polls until it obains the prediction data back from the model server. We then JSON-encode the data and instruct Flask to send the data back to the client. function. This function loads our model and then runs predictions on a batch of images. This process is ideally excuted on a GPU, but a CPU can also be used. to utilize your own deep learning models. , is a new component to our deep learning REST API compared to last week. , later in this blog post. endpoint. It’s up to our Flask web app from there. This section will discuss how to install and configure the necessary prerequisites for our deep learning API server. 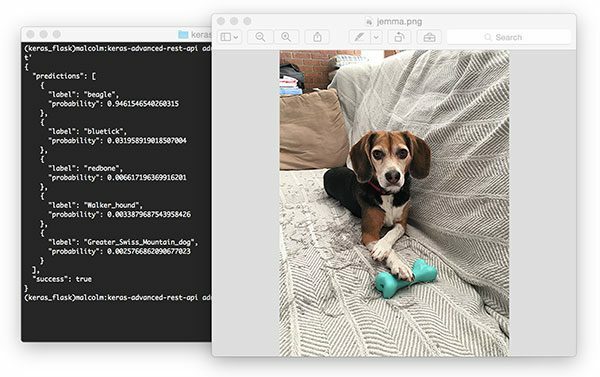 We’ll use my PyImageSearch Deep Learning AMI (freely available to you to use) as a base. I chose a p2.xlarge instance with a single GPU for this example. However, keep in mind that your machine will still be limited by I/O. It may be beneficial to instead utilize multiple machines, each with 1-4 GPUs than trying to scale to 8 or 16 GPUs on a single machine. Redis, an efficient in-memory database, will act as our queue/message broker. if you are new to Python virtual environments. Note: We use TensorFlow 1.4.1 since we are using CUDA 8. You should use TensorFlow 1.5 if using CUDA 9. Other web servers can be used such as nginx but since I have more experience with Apache (and therefore more familiar with Apache in general), I’ll be using Apache for this example. 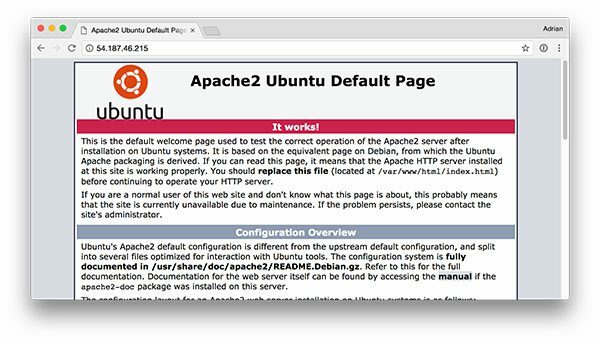 To validate that Apache is installed, open up a browser and enter the IP address of your web server. If you can’t see the server splash screen then be sure to open up Port 80 and Port 5000. Figure 2: The default Apache splash screen lets us know that Apache is installed and that it can be accessed from an open port 80. …which is the default Apache homepage. to your Flask web app. directory for the Python virtual environment. If there is a better way to make Apache aware of the CUDA libraries, please let me know in the comments. Figure 3: Apache + Flask have been configured to work and I see my welcome message. You should now see the text “Welcome to the PyImageSearch Keras REST API!” in your browser. Once you’ve reached this stage your Flask deep learning app should be ready to go. I’ve been using Python + web frameworks such as Flask and Django for years and I still make mistakes when getting my environment configured properly. While I wish there was a bullet proof way to make sure everything works out of the gate, the truth is something is likely going to gum up the works along the way. The good news is that WSGI logs Python events, including failures, to the server log. …so I can see the second an error rolls in. Use the error log to help you get Flask up and running on your server. If everything is working, you should receive formatted JSON output back from the deep learning API model server with the class predictions + probabilities. Figure 4: Using cURL to test our Keras REST API server. Pictured is my family beagle, Jemma. She is classified as a beagle with 94.6% confidence by our ResNet model. Of course, this is just an example. Let’s stress test our deep learning REST API. Even with a new request coming in every 0.05 seconds our batch size never gets larger than ~10-12 images per batch. Our model server handles the load easily without breaking a sweat and it can easily scale beyond this.
. Then you may restart the server. One of the best pieces of advice I can give is to keep your data, in particular your Redis server, close to the GPU. You may be tempted to spin up a giant Redis server with hundreds of gigabytes of RAM to handle multiple image queues and serve multiple GPU machines. The problem here will be I/O latency and network overhead. Assuming 224 x 224 x 3 images represented as float32 array, a batch size of 32 images will be ~19MB of data. This implies that for each batch request from a model server, Redis will need to pull out 19MB of data and send it to the server. On fast switches this isn’t a big deal, but you should consider running both your model server and Redis on the same server to keep your data close to the GPU. 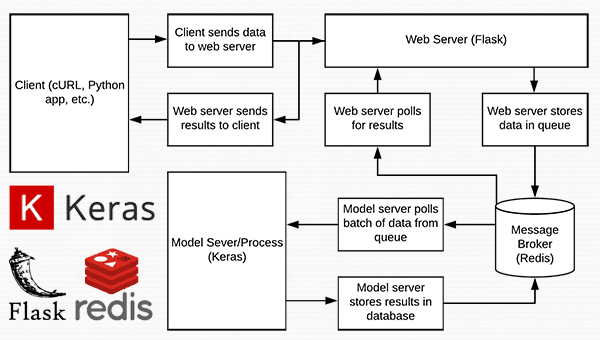 In today’s blog post we learned how to deploy a deep learning model to production using Keras, Redis, Flask, and Apache. Most of the tools we used here are interchangeable. You could swap in TensorFlow or PyTorch for Keras. Django could be used instead of Flask. Nginx could be swapped in for Apache. The only tool I would not recommend swapping out is Redis. Redis is arguably the best solution for in-memory data stores. Unless you have a specific reason to not use Redis, I would suggest utilizing Redis for your queuing operations. Finally, we stress tested our deep learning REST API. We submitted a total of 500 requests for image classification to our server with 0.05 second delays in between each — our server was not phased (the batch size for the CNN was never more than ~37% full). Furthermore, this method is easily scalable to additional servers. If you place these servers behind a load balancer you can easily scale this method further. To be notified when future blog posts are published on PyImageSearch, be sure to enter your email address in the form below! The post Deep learning in production with Keras, Redis, Flask, and Apache appeared first on PyImageSearch.